To buy gold in Russia one can simply go to a Russian bank and buy investment gold coins. Russian banks are selling investment gold coins the appeal of which is due to the exemption of VAT on the coins and no import duty. According to the World Gold Council in their recent 2012 report, the two main forms of gold investment in Russia are physical bullion such as gold coins and gold bars, and unallocated gold accounts. The Sberbank of Russia is probably the most dominant bank offering unallocated Metal Accounts but as one does not have actual ownership of the gold in these accounts but simply ‘share’ the gold, this is not recommended as banks and governments have a habit of using the assets of others in times of need. Better to actually have and hold the gold you buy. Buying real gold bullion in Russia is recommended as Russia has a healthy gold production, with 8 percent of the world’s gold mine production and Russian gold demand remains strong at an annual growth rate of almost 35 percent. 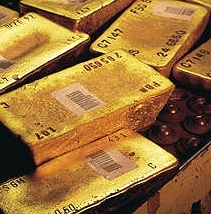 In 2011, Russia had total gold reserves of 5000 tonnes and this seems set to increase. Most of Russian gold comes from the regions of Amur, Irkutsk, Khabarovsk, Kransnoyyarst, Magadan and Sakha-Yakutia. The largest Russian Gold producer is Polyus Gold International (Polyus) and 9th largest in the world. Other big producers are Polymetal Kinross Gold Corp. Petropavlovsk plc and High River Gold and GV Gold. The 4 largest gold mines in Russia produce nearly 40% of the annual Russian gold production. For the past three years Russia has also been buying gold at a rate of 10.2 tonnes per month. This is an incredible amount of gold and gives rise to speculation that Russia is thinking in terms of gold being used to back its currency. In fact, Russia has also been a proponent of gold being included in a new world currency basket based on special drawing rights issued by the IMF. Alexei Ulyukayev, CBRs first Deputy Chairman not long ago stated that “for Russia gold will always be a natural quality asset. "Bloomberg 3rd March 2010. And this is demonstrated with the CBR (Central Bank of Russia) showing a preference for gold in the management of its reserves. Gold as a component of Russia's reserves was equal in 2003, then steadily dropped to a low point in 2008 and has since been on a heavy the rise again. Russian demand for gold jewelry continues to grow at about 8.7 percent per annum as it has over the past ten years and in 2011 rose 16.3 percent, reaching 76.7 tonnes. Russia is now the forth largest gold jewelery consumer behind India, China and the US. As the Russian economy continues to grow at almost 4 percent a year we can expect to see more people buying gold and increased demand in investment gold.